Microsoft in early also announced that the Windows 10 build 10162 is available as an ISO files for users who wish to clean install it on PC through other media devices such as a DVD or a USB drive. With still three weeks to July 29th, the official launch date of Windows 10, Windows 10 build 10162 comes with bug fixes and improvements over the previous builds, including more better reliability, increase performance, long battery life, and improvements on compatibility. 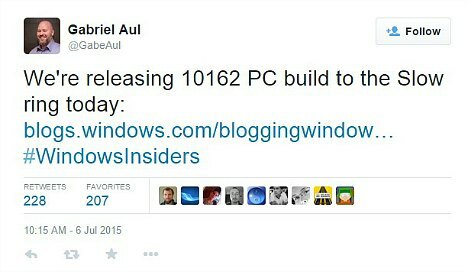 However, it’s believe that Microsoft will continue to roll out few builds to Windows Insider members on the Fast Ring until the official launch date of July 29th.